Calcium deposits can develop almost anywhere in the body and are often harmless. When they turn up in coronary arteries, kidneys, or tendons, however, they require our attention. Calcium deposits can show up almost anywhere in the body but often are harmless. However, they can be serious in three areas—the heart, kidneys, or tendons. This x-ray shows the calcification of the supraspinatus tendon in the upper back, resulting in a painful shoulder. Calcium is an essential component of a person’s body chemistry. Almost all of it is in our bones and teeth, providing both with strength. The rest is present throughout tissues, organs, and cells. Almost every cell in our body uses calcium in some way. But collections of these tiny crystals—calcium deposits—can cause particularly troublesome health issues when they affect the heart, kidneys, and tendons. When calcium deposits are detected in the breasts, the alarm that goes off is often a false alarm. Problems develop when deposits of calcium phosphate show up in the wrong places and in excessive amounts. It’s called calcification. The process can be the body’s reaction to infection or inflammation, or it can be associated with genetic, metabolic, and autoimmune disorders. There is no evidence of a link between dietary calcium and the risk of calcium deposits. When calcium deposits develop inside coronary arteries, the resulting plaque can restrict the flow of blood (and oxygen) to the heart’s muscles. In addition, pieces of plaque can break off, cause a blood clot, and trigger a heart attack. WHAT TO DO ABOUT IT: Your doctor may recommend getting a coronary calcium scan—a test designed to detect and measure plaque in the arteries. If the results indicate that you’re at risk of a heart attack because of an excessive plaque buildup, he or she may recommend measures such as exercising regularly, maintaining a healthy weight, eating healthier foods, stopping smoking, and taking statins to lower cholesterol. Research from UT Southwestern Medical Center in 2017 found that patients without calcium buildup in the coronary arteries had significantly lower risk of heart attack and stroke, even if they had other high-risk conditions such as diabetes, high blood pressure, and elevated cholesterol levels. The findings, published in Journal of the American College of Cardiology: Cardiovascular Imaging, suggest that individuals with no calcium buildup may not have to take stations despite the presence of these risk factors. Calcium stones are the most common of four types of kidney stones, according to the American Kidney Fund. They are present in 10 percent of men and 7 percent of women, and increase the risk of hypertension, chronic kidney disease, and heart disease. Kidney stones can be as small as a grain of sand and as large as a golf ball. Some stones remain in the kidneys and are not a problem, but others move through the ureter to the bladder, where they are supposed to be expelled in urine. If a kidney stone gets stuck in the ureter or bladder, two things happen: 1) it hurts, and 2) it blocks the flow of urine. WHAT TO DO ABOUT IT: Treatment depends of several factors, according to the Urology Care Foundation. Some people simply wait for the stone to pass, as long as the kidney is not completely blocked, the pain is tolerable, and there are no signs of infection. Other options are 1) medications such as tamsulosin (Flomax) that relax the ureter, 2) surgery to remove the stone, 3) shock wave lithotripsy to break a stone into small pieces, 4) ureteroscopy to get a better view and remove stones, and 5) percutaneous nephrolithotomy, in which a small incision is made to enter the kidney and remove a large stone through a tube. If the stone is broken up and then removed, it’s called nephrolithotripsy, explains the National Kidney Foundation. 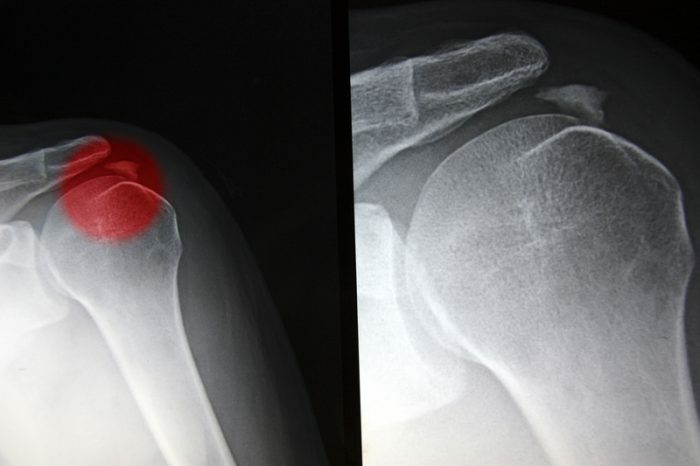 Calcium can build up on tendons (calcific tendinitis), but the cause is unknown. The condition begins to develop in a person’s 30s and is more common in women than in men. Among the causes are age, injury, genetics, dysfunctional immune system, and diabetes. The most common area of calcification is the shoulder, specifically the group of four muscles known as the rotator cuff and their tendons. Calcific tendinitis can also develop in the Achilles tendon, the wrists, hips, thighs, knees, ankles, and feet. Symptoms like pain and restricted range of motion vary from mild to severe. WHAT TO DO ABOUT IT: Treatment options include nonsteroidal anti-inflammatory drugs (NSAIDs) like ibuprofen for pain, corticosteroid injections for pain and swelling, extracorporeal shockwave therapy to break up deposits, ultrasound to break up areas of deposits, and percutaneous needling to remove calcium deposits. Ten percent of patients need surgery. What About Calcium Deposits in the Breasts? The condition is called breast calcifications, and it refers to calcium deposits in breast tissue. They are very common in women over 50. Although occasionally an early sign of cancer, they are usually benign and not painful. They are detected by a mammogram and show up as white spots. WHAT TO DO ABOUT IT: If the deposits appear to be benign, nothing else has to be done. They are harmless. If they look suspicious, further tests, including a biopsy, can give a closer look. In rare cases, surgery is used to remove an area of calcification. Calcium deposits in the breasts are something to monitor, but not usually something to worry about. Calcium deposits are pretty common as we age. They are almost never an emergency, and in all cases, there are a variety of successful treatment options before surgery is needed. Bottom line: Be aware that calcium deposits are a possibility and check with your doctor if and when you have concerns or questions. a heart attack, anti inflammatory, anti inflammatory drugs, blood clot, blood pressure, breast tissue, calcium, cancer, cardiology, cardiovascular, cholesterol, cholesterol levels, chronic kidney disease, coronary, coronary arteries, diabetes, diabetes high blood pressure, health, healthy weight, heart attack, heart disease, high blood pressure, high blood pressure and, hypertension, immune system, infection, inflammation, kidney stones, lower cholesterol, mammogram, nsaids, pain, plaque buildup, risk of heart attack, smoking, statins, strength, stroke, to lower cholesterol. What about vitamin K2 (either mk-4 or mk-7) to help remove calcium from soft tissue and direct calcium to bone and teeth?